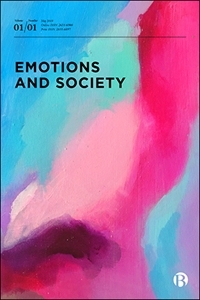 Emotions and Society aims to publish high-quality, original peer-reviewed articles which advance theoretical and empirical understanding of emotions in social life. It is associated with the European Sociological Association (ESA) Research Network on Emotions, but seeks submissions from a wide range of international authors writing in this area. The sociology of emotions has developed unique perspectives on emotions that attend to their social construction and the ways in which they are embedded in social structures and inhere in social processes. The Journal seeks to expand the largely unexhausted potential for developing innovative approaches not only to emotions per se, but through it to the social generally. All methodological approaches to studying emotions are welcome, but they should demonstrate rigour and be framed in ways that will be of interest to sociologically inclined scholars. A key feature of the Journal will be to develop both a uniquely sociological perspective on emotions, while also engaging in interdisciplinary exchanges. This interdisciplinarity will emerge not only from the character of present scholarly debates on emotions, but from the diversity of disciplines represented in the ESA Research Network. We welcome submissions from neighbouring fields, especially cultural studies, history, philosophy and social psychology. Psychology of emotions is quite well represented in existing journals and papers will be considered only insofar as their focus is interactional rather than biological. The Journal seeks to publish articles based on original research into the social aspects of emotions and emotional life. This may include contributions to theoretical debates in the area. Substantial review articles may also be considered. Principally we are looking for theoretical or theoretically informed empirical papers that engage with key concepts and debates of interest to sociologists of emotion, even if they do so from outside the discipline.